Paneer (a fresh cheese) is the most commonly used cheese used in traditional South Asian cuisines. It is of Indian origin dating back to 3000 BC and is described in the old Sanskrit texts (The Vedas). It is widespread in India, Nepal, Pakistan and Bangladesh; countries with a high portion of milk in their cuisine. Unlike many common cheeses, the production of paneer does not utilise rennet as a coagulation reagent. Thus, it is suitable for vegetarians and a major source of protein for Indian vegetarians. It is usually unsalted. I myself am a vegetarian who does not eat eggs or fish and I use paneer quite often in my cooking. 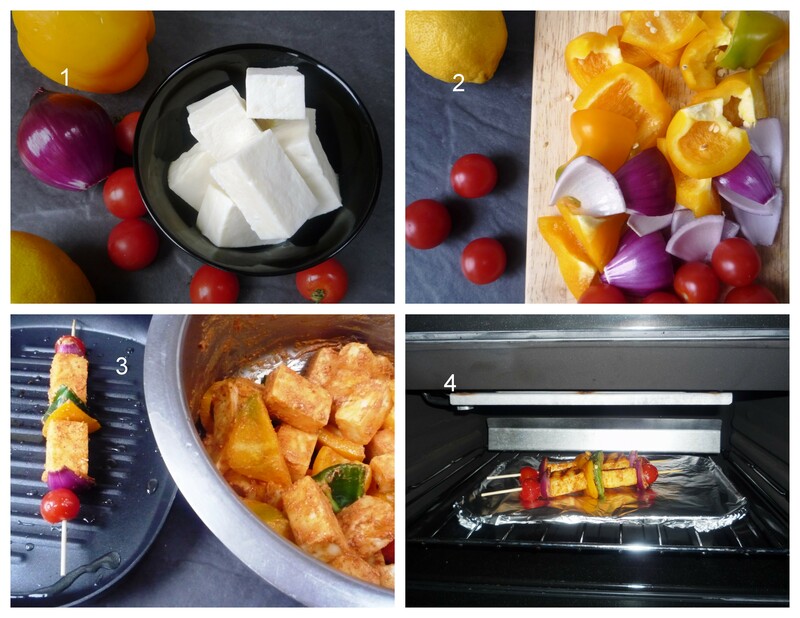 Here I present to you a new dish with this cheese: Tandoori Paneer Tikka. This dish is a classic dish from the time of the Moguls in India. To achieve the characteristic smoky taste, the traditional way of preparation involves the usage of a clay oven but here in the United Kingdom restaurants usually use gas ovens and at home ovens or grills are used. Tandoor is the Indian word for oven. However, in summer you can use a barbecue to imitate the traditional way of preparing the dish. Tahndoori Paneer Tikka is very tasty and has a tangy and spicy flavour. it is often served with green salad and green chutney. If you use bamboo scewers, soak them at least 3-4 hours in water. Soak the cubed paneer in warm water seasoned with salt for 10-15 minutes. Once soaked, drain the water and pat the cheese dry with a paper towel. 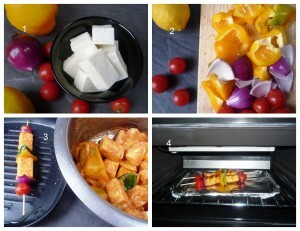 Combine the yogurt with the marinating ingredients and mix well. Now add the paneer to the marinating mix, toss gently and place it in fridge after covering the bowl with cling film for at least one hour. Add the vegetables to the mix 5 minutes before cooking. Once marinated, thread the paneer and vegetables on soaked bamboo skewers. Brush them with oil on all sides. Grill the skewers on high temperature for 4-5 minutes each side. Garnish with coriander and serve hot with green chutney. Paneer is easily available in Indian stores and bigger supermarkets. 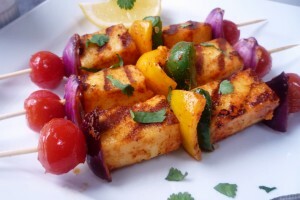 Paneer can be replaced by extra firm Tofu or Halloumi or any cheese which can be grilled or roasting without melting. You can use any vegetables of choice here –courgette,mushrooms work fine. Just ensure that the cooking times of vegetable don’t vary much. For non veg- Can use boneless & cubed lamb, beef, chicken or shrimp. If using red meat or chicken for making this recipe, marinate the meat overnight or at least 6-8 hours to get nice flavors.